Dubai, UAE, October 15, 2018: Yousif Mirza will be part of the final UAE Team Emirates selection for the 2018 UCI World Tour season as the UAE National Champion heads to China for the Tour of Guangxi (16 – 21 October). 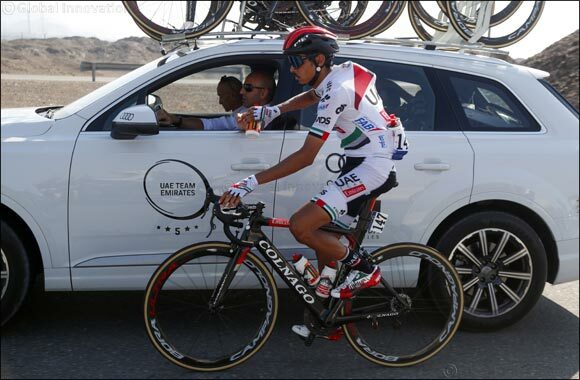 The Emirati superstar will provide support for team captain Fabio Aru, who is looking to end his season on a high and get his first win in UAE Team Emirates colours. Joining the two riders in Southern China will be team-mates Jan Polanc, Alexandr Riabushenko, Ben Swift, Matteo Bono and Oliviero Troia. The riders will be guided through the six-stage race by Sports Directors Philippe Mauduit and Bruno Vicino. The Tour of Guangxi made its debut on the UCI World Tour last year. The format and route is largely the same as last year, with the second stage being the only major change in that it will depart from the port region of Beihai and finish in Qinzhou. The tour will consist of three flat stages and three hilly stages, with the biggest test coming on Stage five – the Queens Stage. This is the only route to go over 200km, with two category three climbs, a category two climb and a category one climb all set to push riders to their physical limit. However, with the final climb almost 34km from the finish line, the breakaway riders will need to be wary of the chasing pack – as we saw last year, with the stage being battled out in a bunched sprint finish.